Measurements: Frequency, Pulse width, Pulse, Pulse freq. The Phase Matrix / EIP 585C/588C Full Function Pulse/CW Counters with an optional Internal Delaying Pulse Generator are Phase Matrix highest performance counters. They are capable of measuring the frequency of repetitive pulses as narrow as 50 ns. A 3.5" full rack sized instrument, the 58XC series offer Phase Matrix YIG filtered front end and optional frequency extension to 170 GHz (on the 588C). 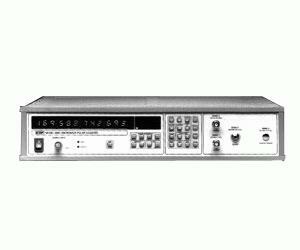 Standard features include frequency selectivity (high and low frequency limits), GPIB, simultaneous display of frequency and pulse width or pulse repetition interval. Optional features include an internal delaying pulse generator for automatic frequency profiling.